Last night came with a lot of steady, rousing, cold rain. It was the first night of the trip where I slept chillier than I’d like. In the middle of the night I slid on (slinked into?) a pair of polypropylene see-thru tights. They constitute my base layer bottoms. They look like women’s nylons, and weigh a scant 1.6 oz. they are horrible to wear against the skin (you poor ladies) so I wear them at night over my trekking pants, which creates a nice warm sleep for my legs. As the rain slowed down and the dark turned to light, I heard the cute tapa-tapa-tap of a woodpecker in the fir tree that the head of my tarp was tied to. It made me smile. Then I heard the second one start in at another tree towards the foot end of my tarp. And then a third to my left. And then there was more. It’s the first time I’d heard woodpeckers in surround sound and at any other time it would have been neat. But I was not done sleeping. I wrapped my windshirt around my head inside my parka hood to muffle the morning reveille and went back to sleep. When I awoke the rain had stopped and there was one teeny patch of blue sky visible above the cliffs to the west. The surface of Dean Lake was glass-smooth save the little dimples that indicated the lazy feeding of trout on dead and injured midges that had been knocked down by the rain last night. I made coffee from my bed, drank it, wrung yesterday’s rain from my socks, slid into my sopping wet and cold shoes, and emerged from my tarp. I saw my shadow. Today might be a better day. I sat down on a flat rock near my tarp and a curious nuthatch came to visit me about 8 feet away. It cocked its head while I was journaling on my iPod as if to say, “Strange thing you’re doing, there…” It pecked its head down here and there, eating huckleberries from my private patch. I was happy to share and I was more fond of it than I was of the woodpeckers from earlier this morning. I couldn’t resist the urge to string up my tenkara rod and see what sort of trout Dean Lake would give up. Within a few minutes of shoreline stalking, I finally found a target. It was clearly a well-colored male brook trout, as I could discern its red belly and white-tipped fins through the sunlit, smooth water surface with my polarized glasses. He was cruising the shoreline at an impressively slow pace, apparently lacking the urgency one might have if he knew winter up here was only a few weeks away. I cast my fly a few feet in front of him and his apathy turned to fury in short order as he shot like a rocket towards my fly, engulfing it like it was his last meal. I brought him to shore and was impressed by his dimensions: 12 inches and about as fat as a mountain brookie can get. I released him for another day, and caught half a dozen more to round out a fine morning of fishing. In the late afternoon, we dialed in a new compass bearing about due west to Bedground Lake, and the 4LB trail. We proceeded southwest to Rainbow Lake, circumnavigated its boggy shoreline to its opposite shore, and discovered a beautiful campsite on the south shore point for our final night on the trail. I pitched my tarp on a tiny rock ledge overlooking the lakeshore hoping to be somewhat protected as this evening’s inevitable thunderstorms blew through. I rebuilt the firepit, built seats, collected wood, and sorted wood by size (my friends call this J’ing the firepit, for my strong Myers-Briggs trait of everything needing to be in order and looking the right way). We had a nice fire, Dan went for a swim, Chase composed music, we talked about math education philosophy, and we made our final dinner feasts with all of our leftover ingredients. We finished the evening reminiscing about past trips and epic days in the mountains. Dan and I (and now Chase, for the past two years), have shared miles, storms, exposure, alternative trip exits, talus, trout, and more: the Winds, Beartooths, Yellowstone, Canadian Rockies, Sierras, and the Uintas. Where will we be next year? As I crawled into bed, swirling winds, the patter of raindrops on my tarp, and booming in the distance made me wrap my windshirt around my head in my down jacket hood, in preparation to muffle the noise of the oncoming tempest. 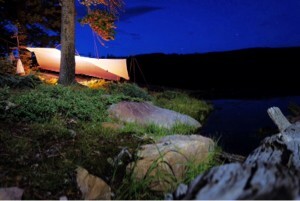 Photo: Tarp camp at Rainbow Lake.